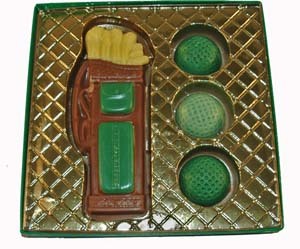 You'll hit a "hole in one" with your favorite golfer when you gift them with this solid Swiss chocolate set from Dorothy's Candies. Hand painted, each set with golfer bag and golf balls, is unique. Colors on design will vary. Order yours today!